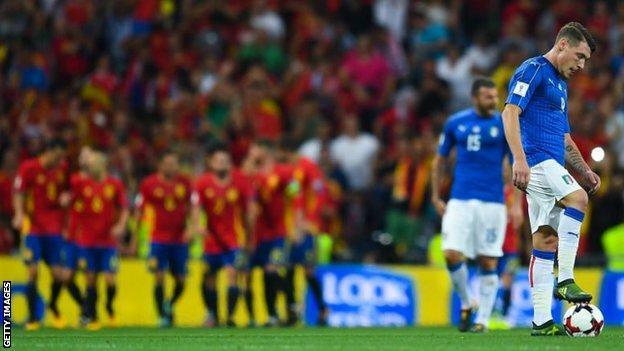 Humbling and humiliating - Italy were beaten 3-0 by Spain in SeptemberYou have to be over 60 to remember a World Cup without Italy.Six decades ago, a 2-1 defeat by Northern Ireland in Belfast meant the Azzurri stayed at home and had to listen to the tournament on the radio. It's why nobody in Italy wanted Michael O'Neill's side in the play-offs. Too many ghosts from the past. In the end, the name pulled out of the hat was still inauspicious. Sweden hosted the World Cup in 1958. The only edition of the competition Italy have missed. Before the European Championship a year ago, Italy's squad was considered the poorest they have picked for a major tournament since 1950. The star of the Azzurri was not a player but the manager Antonio Conte. He made Italy greater than the sum of their parts and fostered a genuine belief that they could win the competition. The continuity candidate - it has not been easy for 69-year-old Giampiero VenturaItaly beat the Belgium of Eden Hazard and Kevin de Bruyne, knocked out Spain and were only eliminated on penalties by world champions Germany. Had they won that shootout, Conte, who became Chelsea boss after the tournament, is convinced the team would have gone on to lift the trophy. Bettering what he achieved with this group was always going to be difficult. Ventura was billed as a continuity candidate. He replaced Conte at Bari and has similar ideas on how the game should be played. But at close to 70 Ventura has never seemed entirely comfortable with his portrayal as a chip off the same block as someone 20 years his junior. He has tried to put his own stamp on the team, insisting Italy play a system unsuited to the characteristics of their best players, Paris St-Germain midfielder Marco Verratti and Napoli forward Lorenzo Insigne.The 4-2-4 Ventura deployed at the Bernabeu against Spain in September was tactical suicide. He did not just lose the game. He lost face. Naturally it did not help that Conte eliminated the same opponent from the Euros a year earlier with a tactical masterclass. Automatic qualification was gone but in truth Italy started the group second favourites anyway.From the outset they accepted a play-off would likely be necessary to book their place in Russia. While Italy did not expect to beat Spain in Madrid, it is also true they did not anticipate losing 3-0. The manner of that defeat and the underwhelming performances that followed against Israel (a 1-0 win) then Macedonia (1-1 draw) at home are cause of great concern. The veteran players called a crisis meeting after the Macedonia draw in Turin, leading to the assumption they were taking matters into their own hands with confidence in Ventura at a low ebb.The reports were strenuously denied. Ventura said he encouraged the get-together. But it is hard to imagine the same happening or being necessary under Conte. The confidence he generated has gradually faded. Only the spirit remains. A legend of the game, 39-year-old Buffon's international career could end with a play-off defeatIt is 20 years since Italy's last appearance in a play-off for World Cup qualification. In another twist of fate, their opponents then were next summer's hosts, Russia. The first leg played in snow and subzero temperatures is remembered as the night a 19-year-old Gianluigi Buffon made his Italy debut as a 32nd-minute substitute for Gianluca Pagliuca, who was crocked by former Manchester United and Everton winger Andrei Kanchelskis. Flash forward to the present day and Buffon, the Azzurri's captain and record appearance maker with 173 caps, hopes his international career does not end where it began in the play-offs. Unless Juventus win the Champions League and call him back for the Club World Cup, Buffon plans to retire once the World Cup is over next summer. He aspires to repeat the heroics of 2006 and also emulate Dino Zoff by winning the competition aged 40. It would be Buffon's sixth World Cup. No-one has been to as many. Not Lothar Matthaus. Nor Antonio Carbajal. Reflecting on Friday's play-off, he said: "The important thing is the result is the same as in 1997." Casiraghi had a career that was dogged by injury but he scored the crucial goal for Italy in their 1997 play-offA knee injury suffered against West Ham just a few weeks later ruled him out of France 98 and, 10 surgeries later, brought a premature end to his career. In Sweden on Friday, Italy will be looking to Ciro Immobile and Simone Zaza to score the goals. For Zaza, the play-offs offer a shot at redemption at international level after his infamous penalty miss against Germany.Ridiculed for his run-up, Zaza has always taken spot-kicks that way and scored every one in training at the Euros. Scapegoated for Italy's elimination, a dishonour he shared with former Southampton striker Graziano Pelle, the guilt he felt at shattering the hopes and dreams of a nation left him "traumatised".Zaza confesses he played under a black cloud at West Ham but the skies have cleared at Valencia. He is second only to Lionel Messi in the scoring charts in La Liga, finding the back of the net eight times in his last seven games and matching a club record for scoring in six consecutive matches. "I don't want to stop now," Zaza says. And with Torino striker Andrea Belotti still not 100% after racing back from a knee injury, Italy are hoping he won't too. Italy haven't lost to Sweden since 1998. They were victorious in Toulouse last summer, retiring Zlatan Ibrahimovic from international football. Belatedly Ventura appears willing to put his principles to one side and go with what worked for Italy that day; the 3-5-2 Conte favoured. Still, not everybody is satisfied. In that system there is no room for Insigne, Italy's pre-eminent flair player who scored against Manchester City in last week's Champions League match and thumped the crossbar. Insigne was in goalscoring form for Napoli against Manchester City last week - but will he play against Sweden[/IMG]To generations of Italians it is unthinkable. They do not know any different.